On the morning of October 6, 1944, Niantic-born William Colepaugh boarded the German submarine U-1230 headed for the coast of Maine. Having only months earlier left his life in America for the chance to serve the Nazi cause in Germany, he now returned to his homeland as a spy on a mission that made national headlines. William Colepaugh was born in the Niantic section of East Lyme, Connecticut, on March 25, 1918. His father was a plumber and handyman who married the daughter of recently arrived German immigrants. William’s father died when William was only 8, leaving him to be raised by his mother. After attending military prep school in New Jersey and failing to gain admittance to the naval academy in Annapolis, William attended MIT where he openly expressed his desire to settle in Nazi Germany at the conclusion of World War II. Increasingly fascinated by Nazi propaganda and disillusioned with his life in the United States, Colepaugh took a job as a mess boy aboard the Swedish relief vessel Gripsholm in January of 1944. Upon arriving in Lisbon, Portugal, Colepaugh jumped ship to offer his services to the German consulate there. The Germans sent Colepaugh to spy school in the Netherlands where he spent 2 months learning how to conceal information and work with plastic explosives. Since Colepaugh had learned very little German, the German army paired him with Erich Gimpel, a German radio technician who also spoke English. The army sent the two men on a mission to report back on American plans for building planes, ships, and rockets. The spies arrived near Hancock, Maine, on November 29, 1944. Carrying guns, cameras, fake Social Security cards, diamonds, and a pile of cash, the two men traveled by train and taxi from Maine to Boston and then to New York City. Without any clear directives for accomplishing his mission, Colepaugh began spending recklessly on food, wine, and women. 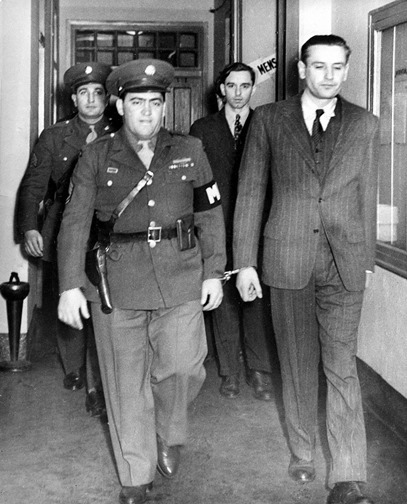 After spending $1,500 of Nazi money partying in New York, Colepaugh had a change of heart and turned himself in to the FBI on December 26th. American authorities arrested Gimpel four days later. A closed military tribunal sentenced the two spies to death, but President Franklin Delano Roosevelt died three days before their execution, and his successor, Harry Truman, commuted their sentences to life in prison, and then later, down to 30 years. Colepaugh was paroled in 1960. After being granted parole, Colepaugh opened a business in King of Prussia, Pennsylvania, before marrying, acquiring a passion for fishing, and volunteering with local Boy Scouts. Later in life he developed hearing problems and then Alzheimer’s Disease. He died in 2005 having declined every interview request he received to talk about his time in the German service. Buffa, Denise. “Niantic Boy Scout Became Nazi Spy.” Hartford Courant. April 23, 2014, sec. Hartford Courant 250th Anniversary. Link. Willing, Richard. “The Nazi Spy Next Door.” USA Today, February 27, 2002. Link.